Ariel, the first fae in the community to actually meet Alex Deveraux, is trying to adjust to life in New York. She may appear strong and self confident on the outside, but inside she is still struggling to deal with a serious trauma from the past. A trauma she wasn’t able to deal with while living in New York. So, years ago, she moved to France to live with relatives. She’s now back, determined to conquer her demons and live a normal happy life. She is thrilled that her new friend, Alex, has recently hooked up with her lifelong protector, Dimitri. Dimitri saved Ariel’s life once, literally. She has loved and respected that warrior above all others for centuries. But since the night she met Alex, another warrior has occupied her thoughts. A dangerous, blonde hunk that seems to be avoiding her. 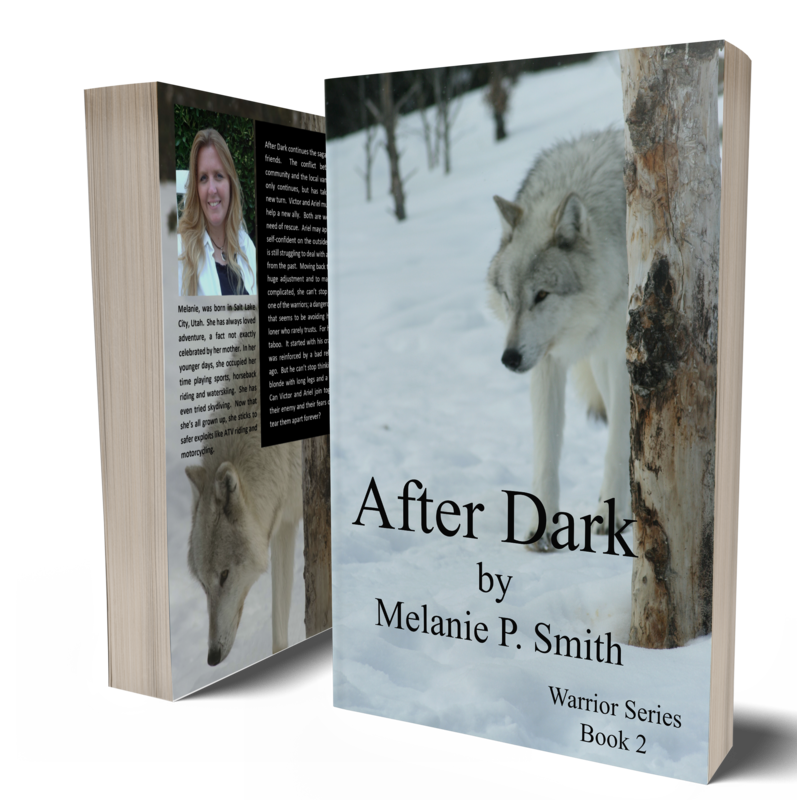 After Dark, by Melanie P. Smith, is the genre I don’t usually gravitate to, paranormal. But where it shines, is where all good stories shine regardless of genre, in the telling of the story. Intrigue capturing the read from the first paragraph with the protagonist Ariel in a panic room, seeing motion on the screen before her. The reader senses the heightened anxiety. Allusions to earlier traumatic incidents, which make it easier to follow this sequel were the reader not to have read the first book, give depth to Ariel’s emotional state. The characters are introduced; the long time friend/savior Dimitri and his partner Alex, the best friend Breena and her partner Orin, among others, including the love interest Victor, and brief mention of the antagonists Radek and Lilith. And as the story moves on more characters are brought in, Ariel’s father, etc. The beginning progresses with Victor and Thomas coming to her aid. Sexual tension with Victor (reticent of becoming involved) appears while the storyline tension of what is lurking out in the evil mysterious beyond sets up the conflict of the story. What is discovered adds a new twist to the plot; two men were in a fight with vampires who absconded with, Abbey, the sister of one of them, Morrigan. Ariel insists on going with him to help find his sister, boasting she knows her way around battling vampires and the story launches forward at a good pace that develops twists and turns and brings intimacy between Ariel and Victor, cleverly starting with tending to each other’s physical wounds, first hers a leg bite, then his burns to his hands from the toxins emitted from her wounds. There are tender moments, especially after scenes reveal what psychological wounds lay hidden in their psyches. The story continues on with plots, twists, surprises, and emotions contemporary and challenging. It was well worth my sit down and read and I recommend it to those who love paranormal storylines, romantic devotees interested in a twist of theme, or anyone wanting to expand their genre of interest into a well written, easy, good read. I received a copy of this book from the author in exchange for a honest review. This is book two in the series and it does not disappoint. The author keeps all the great characters from book one and adds some great new additions. I love the mix of vampires, shifters and fae. Great read and looking forward to book three! It’s always such a pleasure when you settle in with what you hope is a good book, and once you get a few pages in, discover that it really is a good book. This was my experience with After Dark. The second book in a series. It brings to the story new characters who are interesting and go on to develop into a new romance. It’s a “good read”, a “page turner” that kept me engaged to the end.